Sorry, you’re probably getting fed up seeing this image again but I’m not! 🙂 Another premium bond win of £25 means three wins in a row (a ‘Turkey‘, if I was ten pin bowling! ), a record for me! Can I make it a four-bagger!? At work, it was decided that despite the company not hitting their global year-end target, we would still be paid a bonus. That bonus was a whopping 1% but hey, I’m not complaining as that’s still more than zero. Anyway, with nothing better to do with it, I’ve invested the full bonus amount. So, how did that affect my savings this month? I saved 56.6%! My average savings rate has now gone up to 53%. I however still haven’t gotten round to booking my holiday, plus I have a super-busy social calendar in April so the high rate may provide me with a bit of a cushion when my rate drops over the next month or so! The above savings was topped up with my £25 Premium Bonds win, £62.81 affiliate income from OddsMonkey (thanks to all who signed up via my links! ), £300 matched betting profits and £50 rent received. As I don’t earn enough to max out my ISA (the max being £20k in a tax year), this past week has been spent shaking down piggy banks and scrabbling behind the sofa to find anything to top it up before the end of the tax year, due to the ‘use it or lose it’ factor. I managed to find a bunch of old £1 coins so these have been banked – every pound counts and they went towards helping me pay £15k into my ISA. Last year, I managed this amount with the help of some of my redundancy pay (when the max for an ISA was £15k) so I’m really chuffed with this achievement. 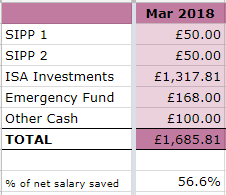 I’m sure some of you might be wondering why I’m also paying into my Emergency Fund instead of concentrating on my ISA – well, I took a chunk out for ’emergencies’ last year so need to top it back up. Once I get it back up to >3 month’s worth of expenses again, I can chuck more into my ISA. I started investing in HICL Infrastructure Company Ltd this month. Think that’s it for new investments for a while, I’ll just top up existing ones for the rest of the year. Wobbly markets again apparently. As before, I didn’t follow the daily ups and downs, just got the month-end figure for my update. My Future Fund stands at £130,574 – it’s down 1% from last month, but whatever, I’ll just continue investing as normal. £238.00 was received – good to see another >£200 payout. Total dividends this year stands at £566.10, so a little behind plan but still a way to go yet with some big payouts in the pipeline! I may as well just copy and paste part of my comment from theFIREstarter’s Cheltenham Festival update. I actually had 3 of the 4 days off work (coincided with me having my kitchen decorated!) but having had quite a few accounts gubbed since the last festival, I knew that Cheltenham wasn’t going to provide me with riches, not that I made riches last year, even with ungubbed accounts! As it was, my profit over the 4 days was just short of £200, but just on horses, this is great for me so I’m happy with that. I’m continuing with my no-lay accumulator (acca) strategy and since I’ve been doing some actual research/checking on the legs, I’ve fared a bit better so have been hitting wins a bit more often, while reducing my losses. Still too fearful to put on big money though, so sticking to mostly £5 and £10 accas to build up my confidence! For those interested in stats, I did 31 no-lays, which resulted in a 32% win rate and 48% loss rate (10 wins, 15 losses, 6 acca insurance, profit £128). This month, I also started a no-lay Each Way (EW) Matcher strategy – I know, all this no-laying is gambling, right? Kind of, but taking into account the EV (Expected Value), it’s still kind of matched betting. What’s the EW Matcher strategy? The EW Matcher is an OddsMonkey‘s tool which basically tries to find profitable scenarios/matches to bet on horses each way (ie win or place). So you back all the horses matched in the tool each way within set parameters. To lock in profit, you would lay those matches. With the strategy I’m following, you don’t lay. theFIREstarter follows a similar strategy. You’ll win some, lose some, will have to swallow some losses but in the long run, the underlying EV will trend upwards. I’m only placing small bets though (50p or £1 each way) but made £194 this month using this strategy. Some weeks will be bad, like with no-lay accas but while I’m achieving an ROI of 19.7%, I’m going to see if this profitable run continues. The good thing is that I’ve been able to use gubbed accounts, where my betting stakes have been restricted. 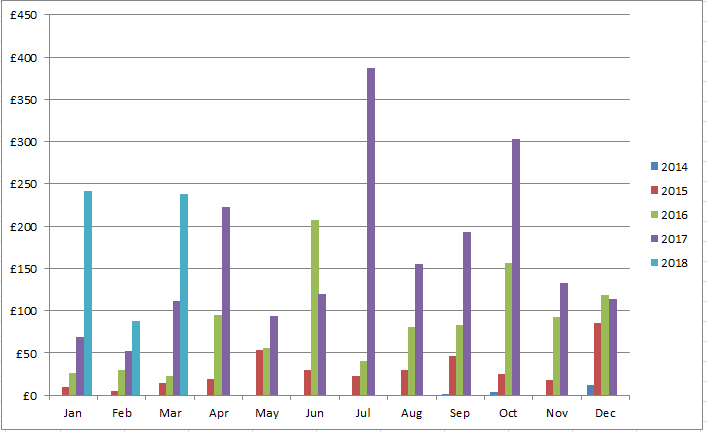 Overall MB profits for the month came to £599, my best so far this year, though not great compared to previous years. Total MB profits so far this year stand at £914, still way off target for my ambitious annual goal. Incidentally, this month marks 2 years since I started MB. In that time, I’ve made £8,939 profit in total – not a huge amount by some MB standards but good enough for me! I’ve tried to preserve my accounts by trying to not be too greedy with offers, I try to not spend too much time on this hobby and hope there are still profits to be made in the foreseeable future. Oh and as a final note in this section, I appear to be ‘ungubbed’ by one of the high street bookies after over a year – I took part in an offer and they surprisingly gave me a free bet! I won’t mention their name here, in case someone realises their error and reinstates the gubbing! Drop me a note if you want to know who it is! Aside from the savings rate, I’m still a little behind on where I want to be on most of these, but it’s still early days. I was contacted by someone who’s working on a TV programme for Channel 5, looking for people (including bloggers) to provide tips and tricks on how to make the most of their money. I declined politely of course – that kind of stuff can be reserved for people who want to do that kind of thing, have their 5 minutes of fame (which is 5 minutes too much for me!) and who might be looking to sell books or courses or wanting extra traffic for their blogs, none of which is what I want. Plus, how can I remain semi-anonymous with my mug and dulcet northern tones on the telly, haha!? Still, I look forward to watching the programme anyway when it gets aired and hope there’s better content than Channel 4’s disastrous ‘How to Retire at 40‘ programme. Anyway, that’s it from me – happy Easter everyone! Looks like a decent month all round weenie, well done. The divi graph is lloking better each month and if you manage £7K between the divis and MB you will be building a nice passive income. I think the entry point for you recent HICL purchase is a good one and should provide a nice boost to your dividend target. BTW how is the home brew coming along…have not seen a post recently..or did I miss one?? I’d had my eye on HICL for a while and noticed that it was trading at a very attractive discount so jumped in and yes, it should give a good yield. I’ve got one batch of home brew conditioning in the garage – a couple more weeks before the ‘taste’ and I’ll be able to do a proper update! Love to read your blogs and interesting to see what others invest in. On the ISA, why not put the emergency cash in to get some more of this years ISA allowance tax sheltered but not invest it and still treat it as your emergency fund? You can always pull the cash out if you need it, sort of like hedging on not having an emergency. Saying that, I don’t do it as fully subscribed on ISA anyway and I appreciate having ready cash on deposit for eventualities is good. Dividends and savings rate look good! I only have a S&S ISA and I’d rather not have cash sitting there not earning any interest. In my mind, my ISA is for my retirement so I don’t want to touch it til then. When I did have a cash ISA in the past, I barely saved anything as I kept dipping into it! Hmmm, I think I might check the funds in my bookie accounts to see what I can withdraw for my ISA! Thanks for stopping by! What is the definition of your future fund? My Future Fund is made up of my SIPPs, S&S ISAs, Premium Bonds, other bits of investments (eg P2P, property crowdfunding), plus the small DC pension I’ve just started paying into at work. It doesn’t include my DB/final salary pension, or what I’ve accumulated in the state pension so far from NI payments. – If you someday need the money, take it out and no harm done as you wouldn’t have filled your ISA allowance anyway. Meanwhile you get tax free interest. – If you don’t need the money and someday in the future have the capacity to overfill your ISA then you can transfer the current Emergency Fund into a S&S ISA while using the extra capacity to rebuild the Emergency Fund outside the ISA. I’m thinking of considering a cash ISA when the interest rates improve – they seem to be creeping up so I’ll just keep an eye out. Right now, as I can earn £1000 interest tax free, I’m better off using non-ISA savings accounts which pay higher interest. I do like the second option you’ve proposed, about transferring and using extra capacity to rebuild the Emergency Fund…let me think on this, so thanks for the suggestion! I’d point out, Weenie, that if you’ve any extra to chuck into your ISA from your emergency fund, might be worth doing it up to the limit. You can always take it out again – no skin off your nose, but you won’t be able to use that allowance again. Consider it a loan to yourself? If it’s a flexible ISA, by putting it in this week and taking it out next week, you essentially carry over some of this year’s allowance into next year. If you’re worried that it’s a s&s ISA, it’s possible to leave some of the contribution in cash in the ISA until you’re happy you won’t need it. Either way, use it (if possible!) or lose it! As mentioned above, I only have a S&S ISA so don’t feel inclined to leave the cash in there not earning any interest and of course, I don’t want to invest it in case I need the money for emergency! However, your (and the other) useful comments have made me think about adding more to try to top up the ISA as much as possible so I’m going to work on that before the deadline! Cheers for stopping by. I’m with all the gang who are recommending you to top up your ISA to the max, if possible. It’s a no brainer in my opinion (assuming Jeremy and his friends don’t get in and start tinkering). I look back on all the years i failed to max out and wonder what on earth i was thinking. Also, as someone who likes to price things up i’d say to you what are the chances of you actually having an emergency, and then being unable to raise the funds. I’d wager that if you were ever in that unlikely position there would be a fair few regular readers of your site who would come to the rescue. You can put me down for a crate of Spitfire bitter if your home brew suffers a horrendous catastrophe this year! Don’t dilly dally, tax year ends soon! I know, 8p is just pathetic yet some people are just too ‘risk averse’ to go for a S&S ISA even when they are saving long term. Bullet dodged on that possible TV appearance in my experience. I’m not sure you’ll find a UK finance blogger who’s had a good experience with them. Nice little MB profit. I didnt have much luck on the AP EWS so sacked it off pretty quickly, just wasn’t worth the time for me but you seem to be having much better luck. Yeah, it’ll be interesting to see who actually makes an appearance and how they are portrayed. Cheers, after a long run of bad luck on the no-lay accas, I’m just glad these EWs are going my way – long may it continue! Nice one with the EW stuff. £190 quid from 50p or £1 ew is impressive! You must have got a hell of a lot of bets on to get up to that with 20% ROI (I guess around 1000 bets). Saying that, loads do come up so makes sense. Do you get away with “spinning the Monkey” (titter) at work like I do? With my stakes that would have been 10K on and 2K profit… I know I made that anyway with lower stakes due to a much higher (lucky!) ROI but I’m just thinking if I can do 10K stakes a month and 20% ROI for 2K a month profit, that would be mega. It would make such a big difference to our bottom line and our savings rate. Anyway. Getting ahead of myself big time here, it sounds like it was just a really good month on the EW matching all round so I’m sure it will revert back to the mean soon enough. Thanks for the double shout out on the links btw! Cheers TFS and I wish I could hack the PB system, haha! Re the EW stuff, I was able to churn through a lot of bets and you’re not far off with the 1000 bet guess (it was in the early 900s). The Easter weekend had me able to place loads of bets and recently at work, I’ve had an empty desk next to me so I’ve been able to ‘spin the monkey’ (as it were!). However, in a couple of weeks time, I’ll have to just restrict myself to just lunchtime so not sure how that will affect my profits. 20% ROI at your stakes would be fantastic – the tough bit will be to ride the variance and funnily enough, this weekend, I’m hitting a big downturn…uh oh! Wow, Ernie just loves you Weenie. I’m with TFS – have you been paying them? Or just naturally lucky? What does your winning “interest rate” work out as? Well done on the savings rate, and for not spending the bonus – impressive willpower there. And it’s always nice to luckily have a lean month when you think the next one might get a bit more spendy. Where are you thinking for the holiday – somewhere warm? And I like your keeping it simple approach on the accounts, and keeping your long term freedom fund separate from day to day and sinking funds. Makes it easier to keep track, and cash ISA rates are still looking really pants. The journos don’t seem to be able to make a decent FI article or show. After the comments session of that frugalwoods article, I’d be very wary about sticking my head about the parapet too. Who wants to be famous? Trust you to ask about my PB winning ‘interest rate’ because that just takes all the gloss out of celebrating the wins as it works out at a paltry 0.5%, haha! Still, 8 more months to go in the year, so that can still go up (I didn’t win anything in April so guess I’m not ‘paying them enough’!). 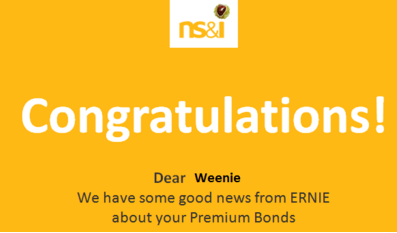 As mentioned before, my premimum bonds represent the only cash element of my Future Fund, so I’m happy for it to be risk free and not beholden to the whims of the stock markets. My hols will be a couple of weeks in Hong Kong to see the family and yes, it’ll be very warm, likely mid 30s – can’t wait for some heat! And yes, I think it’s important that I keep my long term freedom fund separate from the day to day and sinking funds – I wouldn’t be able to save anything otherwise. There was a time when I didn’t keep them separate, meaning that my long term funds never grew significantly as I kept dipping into it (holidays and emergencies). Your luck with Ernie is nice to see. We had a lump sum in Ernie and didn’t even get 6 payouts a year. I gave in after that year and moved the money elsewhere. Didn’t see the point in flogging a dead horse! With your results from Matched Betting I know I really need to get over my concerns and start Matched Betting. I know I can do detail and I don’t have an addictive personality so not concerned about getting in too deep. I think I might be being just a tad lazy as I know initially there is a fair bit of work involved to get up to speed. Is there a difference between Odds Monkey and Profit Accumulator? I’ve had years too where there were no wins but as the rest of my savings (over 85%) is in equities, I need a bit which is risk-free, the equivalent of ‘cash under the mattress’ except with a chance (albeit remote) of winning a prize. They do make terrible ‘investments’ but are boring and safe. Sounds like you have the sort of mentality and temperament to succeed in Matched Betting – the first step is always the hardest and I remember I dithered before I got into it. Just go for it when you’re ready! This depends on what you mean by ‘up to speed?’ As with people comparing their FIRE numbers/networths, I’ve learned not to compare my MB profits with others – those who earn thousands each month often put in a huge amount of time, which isn’t what I do/want to do. I’m happy with the amounts I’m making (of course, always happier if I can make more!) but some matched bettors would think my £600 a derisory amount! Both Odds Monkey (OM) and Profit Accumulator (PA) provide free trials. I used PA before I settled on OM and I guess they’re pretty much the same, except that (and I don’t know if this is still the case) that PA used to charge extra for new tools/software, whereas OM have committed to not charge any extra for new tools/software. Good luck anyway if you decide to give it a go! Having read your post and all the comments I’m now on the edge of my seat to know if you managed to get some more into your ISA before tax year end, and if yes how much! Perhaps you’ll make us wait until next month’s update? I did manage to max out my ISA this year, but it was because of an inheritance I received during the course of last year. I would LOVE to be able to fill next (this) year’s ISA but I have no idea how I will achieve that. I’m just going to keep side hustling away to try to make as much as I can so that I can top it up as much as possible! Haha, yes, I’m going to make you wait until next month’s update about my ISA so I’ve got something to write about! I would love to be able to max out this year’s ISA but wouldn’t even set it as a goal since goals are meant to be somewhat achievable. But like you, I will make an effort to top it up as much as possible – getting to at least £15k is probably something to aim for. 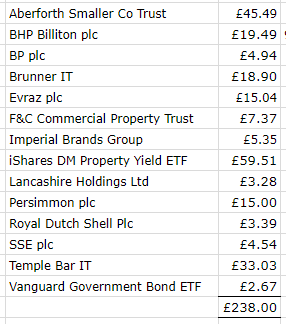 The bulk of my dividend returns are from my Vanguard ETFs and investment trusts. I haven’t bought individual shares in a while (except for my Dogs of the FTSE portfolio experiment), preferring to spread my risks in the ETFs and ITs. Your Lifestrategy funds will be accumulating its dividends rather than paying out, so you’re still winning, only in a different way! Hi weenie. Must have a look through your investment portfolio sometime. At the moment im using vanguard lifestrategy 100 only but as this grows i might pick up some satellite funds to see if i can outperform. Im a bit of a novice though how do you choose your shares/funds? As mentioned above, it’s been a while since I purchased individual stocks but when I did buy, my share screening was pretty minimal – I was basically looking for shares which paid increasing dividends over a 5 year period, preferably with a dividend cover of >1.5 and a P/E ratio (price/earnings) of <20. I'd say I'm happy with the majority of my purchases, only a couple have turned out to be duds but no real harm done due to the small amounts invested. To keep transaction fees down, with the exception of a couple of purchases (because I didn't know better), I used my platform's regular investment facility to purchase the small share quantities, so only paid £1.50 for each trade, instead of the usual £10-£12 fee. At some point, I'll top up some of the shares but I'm concentrating on building up my basket of investment trusts at the moment. With these, I'll gone for several 'dividend heroes'(https://www.theaic.co.uk/aic/news/press-releases/aic-dividend-heroes) and then picked the others based on their discounts, dividends and their holdings. I’ve gone for a mixture of growth and income, only because that seemed to be the best way to go. Nice interest rates with your P2P. I’ve only got around £1000k in P2P now and slowly moving all my money out so I can concentrate on my S&S ISA. Any particular reason why you’ve pulled out of p2p? Two reasons – to start simplifying my portfolio and to divert the cash into my ISA. Had I been able to convert my existing P2P accounts into a new innovative finance ISA, I would have kept the money where it was but I could only start one of these ISAs if I pumped in more money, which I wasn’t planning to. I haven’t cancelled any P2P loans or anything like that, just withdrawn cash as the loans have been paid. Great post weenie, a big chunk saved this month. Interesting that you have reached the 2 year matched betting mark. I hit my 2 year mark last year but I haven’t made as much as you and have since stopped, I do get tempted to start again though. Well done on investing the full bonus too even if just 1%, it all adds up :). TheFIJourney recently posted…First post – Meet me! Cheers Chris. I always planned to make small but steady profits with my matched betting so am happy that I’ve hit the two year mark and am still able to make (what I believe to be) decent profits. I guess it’s all about expectation – someone expecting to make 1000s isn’t going to be happy with my 100s. Hopefully, MB can be a long term thing for me. Good luck if you do consider starting up again.